I am on the road in Holmes County, Ohio, so internet is touch and go, but I just found a little Burger King wi-fi. This shot from this morning from Wayne County should give you a good idea of the wind and weather. Lot of laundry out today. Don’t eat too many französisch frites. Whew! Hold on to your hat! It is very windy here in Central Illinois too. Like a windy day for drying on the line but sometimes it can get too windy and even the clothes pins won’t hang on to the clothes. Have fun and have a safe trip and if you head this way, please do let me know. I had the same thoughts as Alice A. and Linda L. The winds here in northeastern IL(45 mi. n/w of Chicago) are in the 50mph range (wind advisory thru 6 p.m. CST). But we had a lot of snow last week (previously, it looked like your photo, up until about 2 weeks ago). 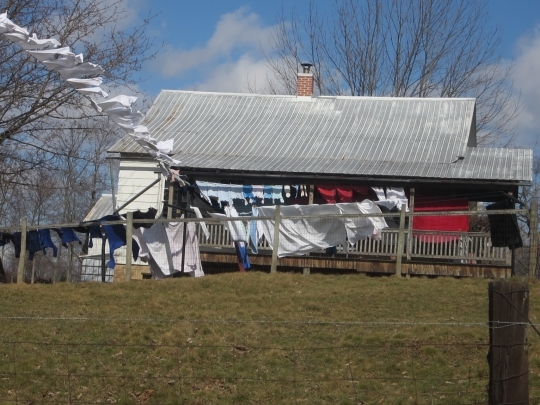 I used to hang my laundry, but wouldn’t do it in such high winds (losing battle, and lots of “re-dos”!) But just looking at that photo brings back memories of freshly laundered and line-dried sheets…ahhhh! We live in the Keweenaw Peninsula of the Upper Peninsula of Michigan. I sure enjoy reading these postings every day. The one today of laundry billowing in the breeze reminds me of my mom. She used to hang all our clothes out. Can’t beat the smell of fresh sheets on the bed. Right now, we have 20 degrees, snowing hard and snowing sideways. Could be worse, it’s not snowing! Check around and see if any Amish farmers are missing their horses. Burger King using horsemeat in them burgers now. Looks like someone put together an invention to get a house or barn to fly. High and Low flaps. Hey you are in my stomping ground, almost (we’re in Medina County). Nelson lives in Holmes area and you’d enjoy meeting each other, I do believe! Yes, our house feels like it’s going to blow off foundation! Looks like when it is very windy here in Nebraska. I can remember hanging clothes in the wind like this when my kids were little and still living at home. They did dry very fast. My Mom used to love sunny, windy wash days. I can just smell the fresh line dried towels laying on the table waiting to be folded. This brings back memories. I remember loving to hang up the laundry on the line when I was a kid. A few years ago for Mother’s Day, my husband rigged up a pulley system from two trees. I could do it all from my deck! It broke in a wind storm, so I must put that on his Honey Do list! I’m in a community where we have a bit of a public transit system and yesterday the bus I was on was shaking from the force of the wind at that particular moment. The driver nearly lost her uniform hat standing outside the bus helping a physically challenged man on a scooter board the bus, I imaging her was feeling blown about too. Wish I were there! I wear hats a lot and I am sure it would get blown off in that wind! Horse meat so far hasn’t been found in BK’s here in the states. I have only visited the Amish in MN and WI during the spring, summer, and fall. Our temps have been terribly cold lately, that it makes me wonder if they must dry their clothes indoors during the winter months? Perhaps in the kitchen near the oven? My in-laws don’t have a dryer by choice, and they love the moisture it puts in their home during the winter. Are you in Wayne or Holmes County…. do not leave with calling me, please ,,,,we can meet at Wall house, and will buy you a good sanwich , coffee , and ice cream…..
Will do Mary, my visits this time were a mixture of old and a little new. I think this was my first time up when there was snow on the ground (snowed the first evening on arrival–Friday) though it thawed out pretty well on Sunday-Monday.